Properties built in a flood prone area in Popua Village. 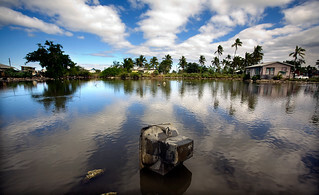 Popua Village is located on the outskirts of Nuku'alofa, Tonga. Tonga's small and open economy is vulnerable to external shocks and was hard hit by the global financial crisis. Development challenges include high levels of debt, limited employment opportunities, and low private sector investment levels.